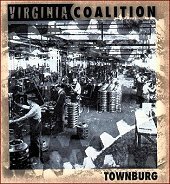 Ambrosial, mellow pop music with a groove, Virginia Coalition's sophomore full-length, Townburg has room for improvement and a ways to go before it achieves the lush, beautiful pop hooks it desires. But, as it stands, it delivers enjoyable, engaging pop music that will find you listening all the way through more than once. "Lonely Cowboy" strikes you with a hearty groove, sweet keyboard balance, and deep, hitting vocals that are tender and breezy. The song invites you to party with it, setting the groove right in your lap and leaving you no choice but to get in and enjoy yourself. "Likeness" is a smooth, light pop ditty injected with some jazz classy-ness and some silky vibes. "Luminiferous Ether" keeps the danceable grooves alive, while "A Song" sits you down and tells you a story while you relax and smile. Jazz-infused, tender pop music, Virginia Coalition is on their way to developing a light, but tight pop sound. Townburg is a decent pop effort that will blow in your background and comfort you with its gentle, soothing vibes. I'll give it a B-.